Summary: Izzy Cervantes is apprehensive about her month at Camp Foxtail, even though her best friend Mackenzie is going with her. Things seem a lot different from Camp Sweetwater, where Izzy has been a leader for the past several summers. For one thing, she and Mackenzie are put in different cabins. 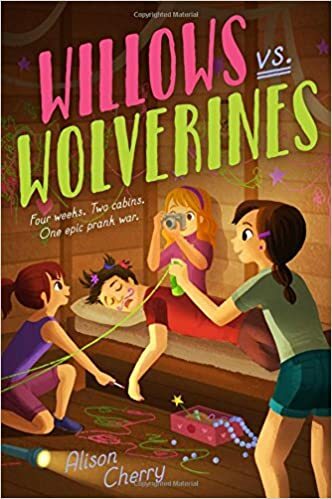 But she’s excited to learn that her cabin, the Willows, has a traditional prank war with the Wolverines, one of the boys’ cabins. At Camp Sweetwater, Izzy was known as a prank queen, but the other Willows, all Foxtail veterans, don’t seem interested in her ideas. So Izzy invents an older brother, Tomas, claiming he was a Wolverine and a pranking champion. She pulls off a pranking victory, and finds herself in the middle of a popular group of Willows. But their friendship comes with a price, and Izzy can’t understand why Mackenzie is acting so cool toward her. By the end of the month, Izzy has learned a lot about friendship, telling the truth, and herself. 352 pages; grades 3-7. Pros: A highly readable summer book, filled with a host of diverse characters, and a narrator whose voice rings true. Readers will be ready to sign up for summer camp after reading about the activities and hijinks and Camp Foxtail.